Home > Community > Introduction to Engineering 101? 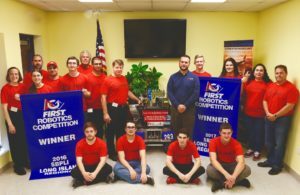 It’s not an official course to be sure, but the Retlif-sponsored Sachem High School Robotics Team received an invaluable engineering education in building a robot and adding the title of “Winner” to an already impressive resume. Retlif Environmental Laboratory Supervisor Michael Hull was on hand when students and parents showed their appreciation for Retlif’s continuing support at Retlif Headquarters in Ronkonkoma. Sachem’s Kaitlin Tripi gracefully presented a plaque to Mr. Hull expressing the gratitude of all participants, students, faculty, advisors and proud parents. 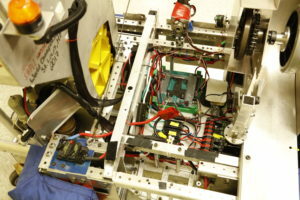 The Sachem team built a robot from scratch with a strategy to handle multiple elements of the competition. 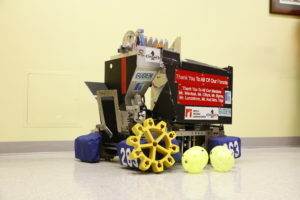 In particular, the speed and maneuverability from the mecanum wheels, which enabled the robot to move in any direction, made it an extremely effective gear loading bot. The judges also thought so and the rest is history. Will there be a crop of budding young engineers that “boldly go forth” to professional engineering glory? No one knows for sure, but having Retlif behind them and the educational, confidence-building experience of winning such a competition, can fast forward young minds in the direction of a truly meaningful and rewarding career. And were the students proud of their engineering feat? 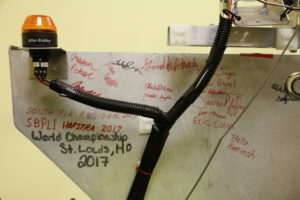 The autographs on the robot speaks volumes! As does their visit to Retlif to present a special plaque. 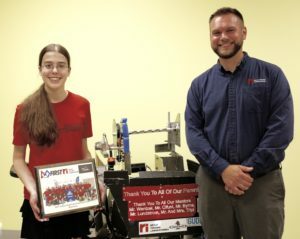 Retlif has supported the Sachem Aftershock Robotics Team since 2000.